We should be getting close to those depths of hell. I was sure we were getting close after riding through all that lava rock. Last night I thought I could see the fires of hell burning somewhere on the other side of Diamond Lake. Today’s journey takes us up to the top of the volcano, Crater Lake, to be specific. When we start there are still cyclists getting ready. A few pass us as we begin climbing, which is literally rolling out of the parking lot. More cyclists should be passing us on this hill, but they are not and this makes me a bit nervous. When we finally reach the first rest stop, we discover that the cyclists we thought were ahead of us have “bumped” to the top of the crater. After you have done a few tours you don’t feel like it is so necessary to ride every mile and Crater Lake is a great place to get a ride in the sag so you have more time to spend enjoying the great views. Short version, we are now dead last. This shouldn’t matter but it always seems harder for some reason when you know you are last. Yesterday we followed two riders, Bruce and Andrew up the last climb and even though you shouldn’t be able to draft on a slow hill climb, this made it seem so much easier for both Sharon and me. At the crater’s edge, I have time to ponder over something. Have we triumphed over the volcano upon reaching the top, or do we need to descend from crater lake to have won the battle? Perhaps the volcano wins if we sag in at all. We are last to every rest stop, except for Ken who has backtracked to get his cell phone. He eventually catches up after dropping 15 minutes behind us and passes us after the lunch stop. By lunch I am sure Sharon is ready to sag in, but she wants her “bragging rights” at this point. It’s still 40 miles and about 2000 feet of climb to go. At mile 100, we are treated to a technical descent that takes us almost to the end of our journey. The last few miles seem to take forever. We have traveled through hell and back again, somewhat unscathed, other than some sore knees and sore butts. The next day, while we are being driven to the final hotel where we will catch a shuttle to get to our car, I snack on a few Twizzlers, however they have lost their awesome flavor. I’m back to being a Red Vines man. We finish the day with 116 miles and 5300 feet of ascent. We finish our tour with 1206 miles and 68,800 feet of ascent. The PAC Tour SAG team was amazing. They did an incredible job of keeping track of, feeding, photographing, cheering, and everything else they do. The Pacific Crest tour was a difficult challenge, but the one thing that was not was all the stuff that happens after rolling into the finish for the day. Lon and Susan do an amazing job of coordinating the ride. 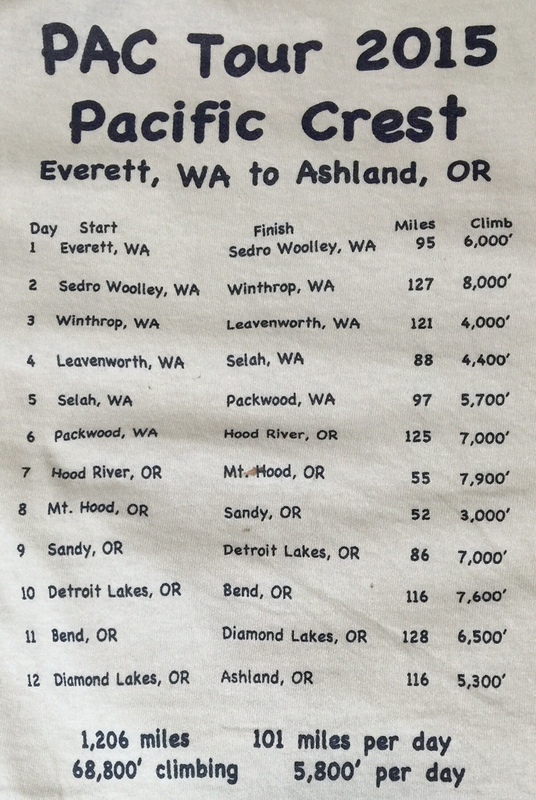 The Pacific Crest tour has been the most challenging and fun ride Sharon and I have ever done. 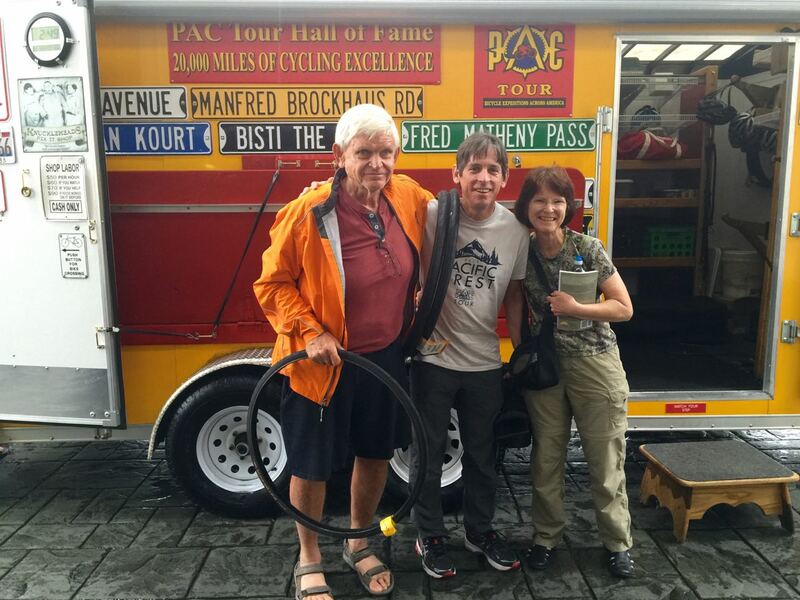 PAC Tour was recommended to us by some of our bike riding friends. They all talk about Lon and Susan as if they are extended family and I don’t think I fully understood this until now. I can’t even imagine how big Lon and Susan’s extended family must be with their Race Across America participation, their tours, and their charitable organizations. I definitely recommend doing a PAC Tour and especially this route to all my serious cycling friends. I don’t know if taking a tandem is the best option, but I dare you. That’s right, tandem buddies, the gauntlet has been dropped. If you are considering this or any of PAC Tour’s rides, check out the PAC Tour website (http://www.pactour.com). This is a difficult tour and you need to be really prepared. Read everything you are sent leading up to the tour and try to follow Lon’s training guide. The route slips are quite detailed. I had difficulty reading them while captaining the tandem, but a 10 mile detour was plenty to motivate Sharon into acting as navigator with route slips pinned to my back. With the Garmin failing miserably even though the routes appeared to be correct, this was a real necessity. Be prepared to increase the size of your extended family. A ride like this has a way of bringing people closer together. Sharon and I already miss our new friends that shared this amazing experience with us. A concern a new potential tour rider might have is whether their bikes and equipment will be handled poorly and possibly damaged. I am about as picky as it gets about this, however our bike was handled as if it were one of their own whenever it had to be stored or transported. 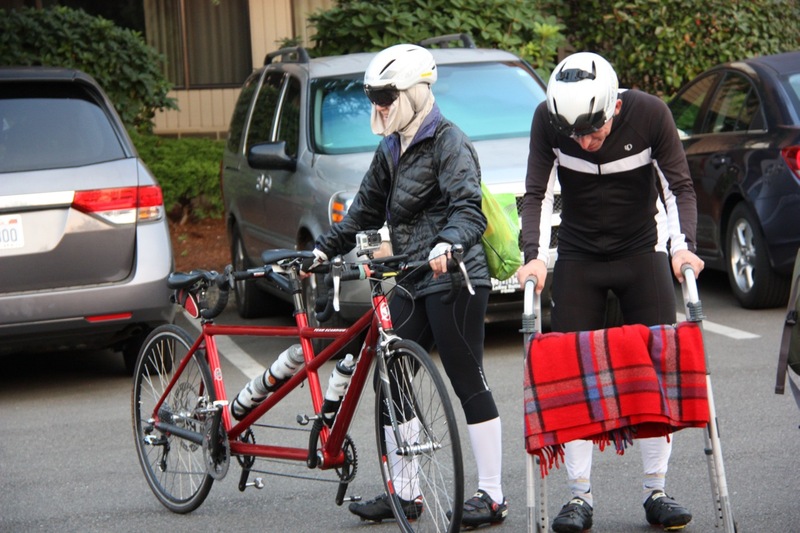 I think that I may have looked nervous when they were packing up the bikes on the last day to driven to SeaTac, however I was really just impressed with how well they were able to deal with transporting that many bikes. When you first do a really epic ride on a bike, it ceases being just replaceable stuff. It now holds the memories of that and every other amazing ride you did on it. I think PAC Tour really gets that. There was storage space on one of the sag vehicles for laptops and may riders used it. I instead brought a cheaper Raspberry Pi computer to view recorded videos and post updates about the ride. Had I known how well laptops were handled beforehand, I would have just brought my laptop instead. ? It was great to have the two of you on the tour. Hope to see my new adopted PAC tour siblings on another ride some day. Might need to wait for Sharon to forget about how hard the ride was, but don’t worry, she will. Thank you Tom and Sharon. I “Rode” with you through the tour. Absolutely beautiful scenery. I’m with you on the Vines Vs. Twizzlers, NO comparison. Do you know if Garmin has fixed the bugs? I’m a geek wannabe. I have NO need what so ever for a Garmin, but WANT one badly. Hopefully you’ll read this and answer these questions. Do you know of any bike shops in Fresno/Clovis where a guy could do a little free work in exchange for learning? I would love to trade some free labor for learning. Thanks for reading Tom. The Twizzlers did actually taste good though during the tour. Not sure why. Garmin has not fixed the bugs yet. I’m on the same software version that I had these problems with. On a recent ride, mine locked up right at the end of the ride but fortunately the ride was there when i force rebooted it. This bug is probably only on the 1000, but that’s the one that supports all the new hardware they just released. They now have a headlight that changes its angle depending on how fast you are going, a camera that can record with your ride info superimposed over the video, and a tail light that that is also radar to warn you about rear traffic. Might want to lean back a bit now so none of the drool gets on your computer. The issue is software related and should be fixed, hopefully on the next update. There’s some things that I don’t like about Garmin, but they are the only option for this sort of hardware right now. I would just go to a few shops in town and ask if they would want to trade labor for knowledge.